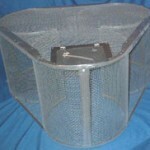 TRAP DESCRIPTION:16" Clover Trap 3-16" Diam. 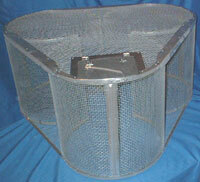 15" Tall Drums 1/4" Mesh.The cloverleaf traps are made with a 23 gauge frame, 22 gauge center supports, and 1/4" welded wire mesh. Unlike the square traps, the minnows are able to swim in from all sides. Due to the size and holding capacity of trap, please check your state's regulations. WHERE TO USE IT: Place in water at the edge of banks where minnows are in abundance. RATE OF APPLICATION: One or more depending on your needs.